As temperature plummeted across our region, and winter markets are picking up, I’m more in the mood for soup. Saturdays are the perfect day for us because I only need to cook once for 2-3 meals over the weekend. 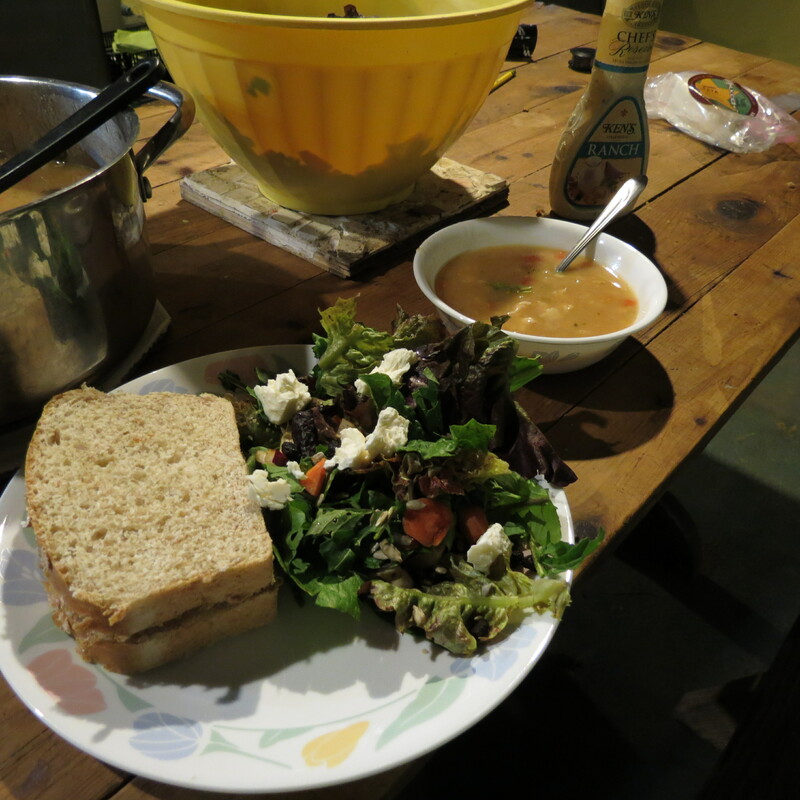 This week I made chicken and white bean chili using a slightly modified Food Network recipe, salad from the veggies that we didn’t sell at Wholesome Living Market Place today and peanut butter and jelly sandwiches on our own spelt bread. I use real chicken, not ground chicken, I didn’t add corn and I did add cilantro. The salad came back from a small indoor market that Rob went to today. It has romaine, green leaf, red leaf and arugula from our gardens. Also I chopped 2 carrots and 5 radishes on top. The cheese is from a trade I made with High Country Creamery today at the Mountain City Traditional Arts Market. The sandwich is made with our very own Spelt bread, fresh ground honey roasted peanut butter from Fisher’s Country Store. Also the boysenberry jelly was made by my boys’ old babysitter Rachel Bender. She owns Summer Kitchen Jams and you can purchase her wonderful creations there. I hope all of you will consider continuing your commitment to buy locally this winter! There are so many wonderful foods available from local producers this time of year too. I will do my best to help you all find out what’s available.